What: A temporary installation involving live interactive video. Concept: A abstract monument to the role forgetting plays in the formation of individual, community, institutional and cultural memory. A place to consider what has been left out of the narrative in the area the fountain is installed. It will be a 8 or 9 foot cube made out of plywood or some other material(if I had the resources I would make the surface work like a fountain with water running down it or cover it in ice in the winter). Note: Testing an 8 part digital feedback loop(Sierpinski carpet) processing footage of water. Made as part of residency at the Anchorage Museum. The cube will have footage of water projected on one side which will also be set up with a camera to make a 9 part feedback loop that creates the Sierpinski carpet fractal pattern like the one in the video above. The water could be recorded from the area, or even produced from a live feed recording a river, or other body of water. Note: Illustration from Benoit Mandelbrot's The Fractal Geometry of Nature. Inspiration for proposed installation's structure/design. The pattern will be live so that anyone that walks between the camera and the projection will become a part of it. The other sides will be video mapped with the same footage to make a digital fountain of sorts. The image above gives an idea of what the surface pattern would look like. 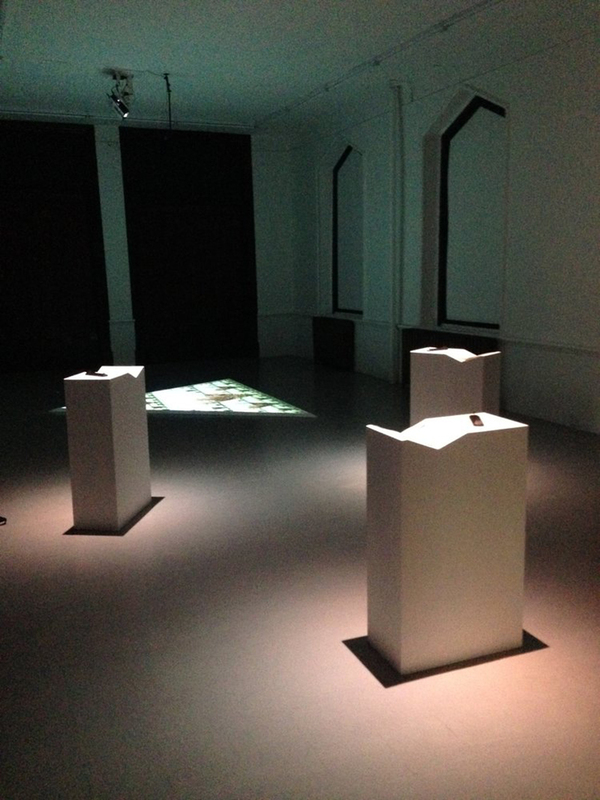 Note: Install view of iteration 1 and 2. video feedback loop, 3 pedestals, artist books and viewfinders. Point A, Point B, Point C revolved around locating three places in Pittsburgh where from each the other two are visible. The project builds from earlier work including an installation I did in 2016 called Point A, Point B, Point C, but instead of focussing on fractal geometry as it relates to place and space the fountain is more interested in the relationship between memory and forgetting. Note: Detail of Iteration 1. 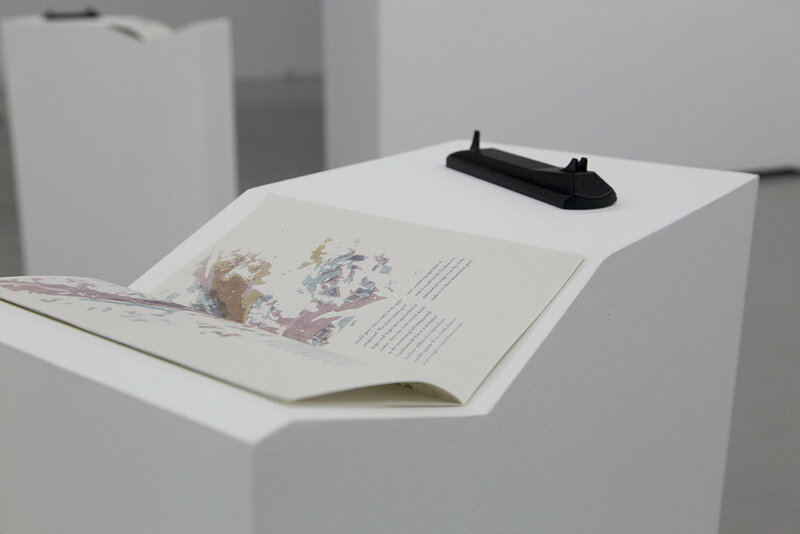 Artist book, custom pedestal and 3D printed viewfinder. Note: Detail of Iteration 1. 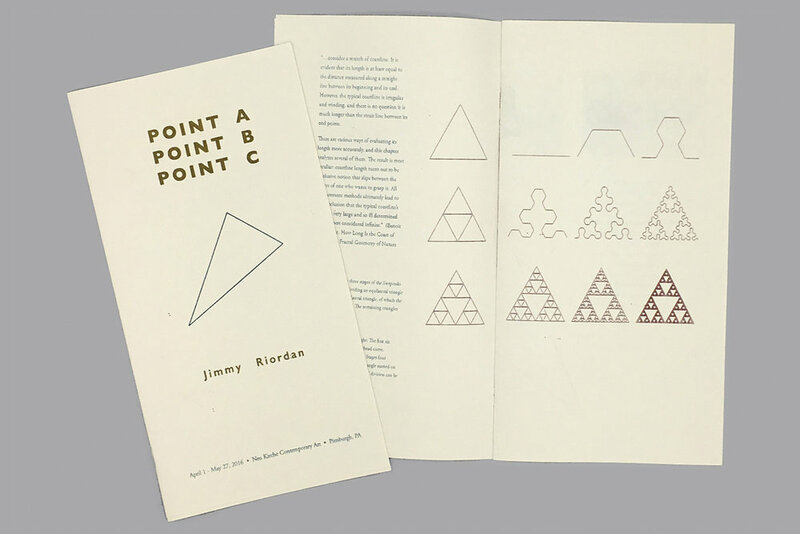 Artist book spread Illustrating Sierpinski arrowhead fractal pattern. Note: Digital video Sierpinski triangle/arrowhead feedback loop. Installation view. Technically the live feedback loop works like a traditional feedback loop where you set a camera up in front of the monitor that is playing what it records creating an infinity tunnel, but by adding the equivalent of more monitors(I divide the projection into multiple frames) it creates more complex fractal patterns. Note: Illustration of how a traditional 1 screen and a 3 screen feedback loop operate using video monitors which play back the live feed of a video camera directed at them. Note: Illustrating how an 8 screen feedback loop operates, creating a Sierpinski carpet. Note: Testing Sierpinski triangle feedback loop process used in Point A, Point B, Point C using LED lights. The video above is a good example of how interactive the surface can be. Conceptually the piece is memorializing the important role forgetting plays is the formation of memory. It builds from the coastline metaphor put forth by Marc Auge in his book Oblivion. You cannot have memory without both remembrance and forgetting.